Shoppers need never run out of cash on Bury Market thanks to the installation of an ATM cash machine. The ATM is located in the entrance to the market hall, next to Katsouris and Kids Connection. Customers will not be charged for using the ATM, which has been installed by DC Payments. Councillor Sandra Walmsley, cabinet member for resource and regulation, said: "Bury Market has such a huge range of stalls and goods that customers may find themselves running short of cash. Having an ATM on site is something that market visitors have been asking about for a long time, and we're delighted that we've now been able to install one, which people can use without being charged. "We've recently welcomed our 1,000th coach tour to the market this year and this ATM, along with our newly opened toilet facilities, shows that we are determined to keep Bury Market as one of the top attractions in the whole of the North West." 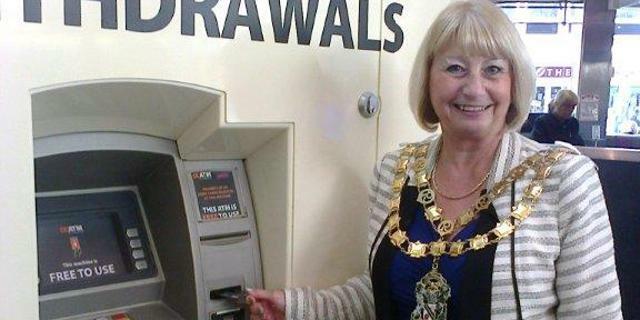 Picture: Councillor Sharon Briggs, deputy mayor of Bury, officially opens the ATM on Bury market.